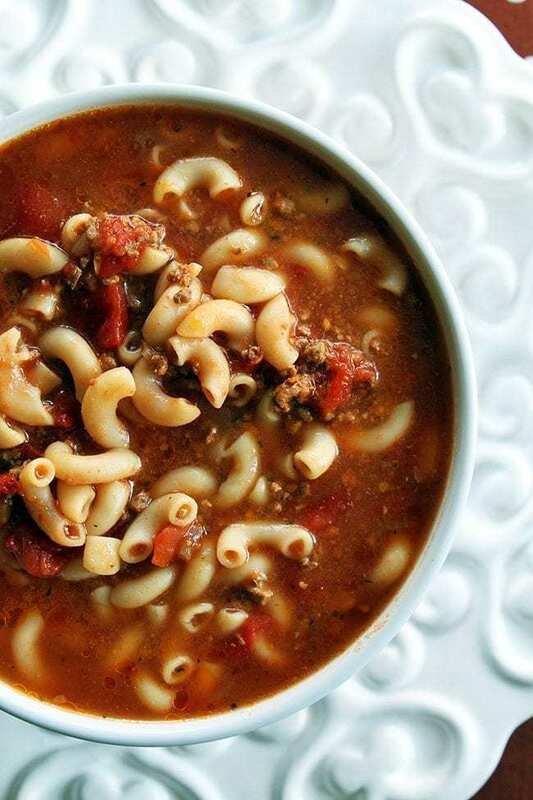 This Beef & Tomato Macaroni Soup is one of the best soups you can make, especially for colder weather as it warms you right up. It’s easy to make and a classic from my childhood. I hope you like it! 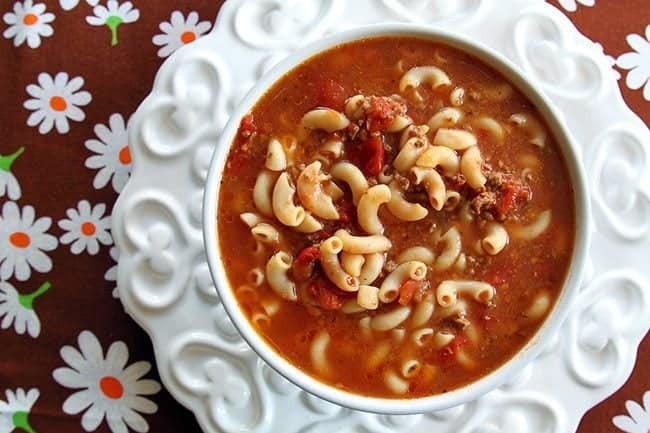 Classic Beef & Tomato Macaroni Soup – One of my family’s all time favorites! When we were in the States last winter we stopped in at a little place on the I-15 that we have driven by countless times. Oh, don’t ask me where or what it’s called, but it’s a rest stop that has a small little town by it. I would know it to look at it and while we always stop to stretch our legs, we’ve never eaten at the small roadside restaurant. Until this last trip, that is. While everything on the menu was nice, not fancy, just a decent clubhouse and salad, the soup of the day reminded me of one of my very favorite, old fashioned soups that I hadn’t eaten in years. I forgot how much I love a Beef & Tomato Macaroni Soup. Oh man, is it ever one of my favorites! It has been on my list to make ever since then – which was way back in January. I rarely make soup that’s not in a crock pot. I think that most soups are improved by letting them simmer all day, the flavorings melding together in ways that a quick 20 minute simmer just doesn’t achieve. Plus you have that little happy thought in your head all day long that your dinner is going to be just amazing when you get home! Doesn’t it make a difference in your mood, knowing that you have a hot, delicious supper waiting for you? I think that’s why I love my crock pot so much. What I love about this method is that you pre-cook the noodles (morning of, day before, it doesn’t matter) and then you add them in at the end of the day, just long enough to heat them up. The soup simmers all day long if you want, then when you come home, you have it waiting for you. Just add the pre-made noodles and there’s dinner! This is truly a comfort food. The day I made this Mike was sick with a cold, tired and achy and it literally made his day to have some of this soup. It was also a snowy day, which always makes me pull out the crock pot and clear a permanent space on the counter for it. It won’t leave the counter again until spring now! My biggest suggestion for this recipe is to drain and rinse the ground beef. You can see that this soup has a bit of grease in it (and oh…that is what makes it so lovely!) but a lot of recipes don’t even have you drain it. I’m going to go ahead and say eeewwww to that. I’m such a pro. The stronger the beef broth the more beefy your soup will end up and a little extra Worcestershire sauce helps with that as well! I prefer adding in dry macaroni 30 minutes before serving but if you are in a time crunch at the end of the day, pre-cook and then add the pasta in. The whole blinkin’ family ate this. I am astonished. I cannot believe my daughter ate this. Loved this. Ate it for lunch the next day. Needless to say this is definitely on THE ROTATION list. I wrote that in caps because that is the really important list, the list where we all love a dish, it’s easy to make, not too unhealthy and saves my sanity. It’s sadly a really, really short list with my picky eaters. I really hope you give this classic a whirl! Talk about comfort food, this beefy macaroni and tomato soup is seriously the best thing I have tasted all fall! There’s a reason it’s a timeless classic! In a medium frying pan, brown the ground beef, onion and garlic until ground beef is no longer pink. Drain the grease (I also like to rinse it with hot water to remove most of the grease) and place in a large crockpot. Add the broth, cans of chopped and whole tomatoes, Worcestershire, ketchup,brown sugar (if wanted) and Italian seasoning. Add more sugar and Worcestershire to taste if needed. Place the lid on the crockpot and cook on low for 8-10 hours. When you are ready to serve, either add the dry macaroni and let cook for 20-25 minutes OR add cooked macaroni. Let the macaroni heat through and serve! Press the saute button and fry the ground beef and onions until the beef is no longer pink. Add in the garlic. Fry for another minute or so. Drain the grease. Add in the remaining ingredients except for the macaroni. Cook on the SOUP setting for 10 minutes. ( this really helps get the beef flavor going.) Release the pressure manually. 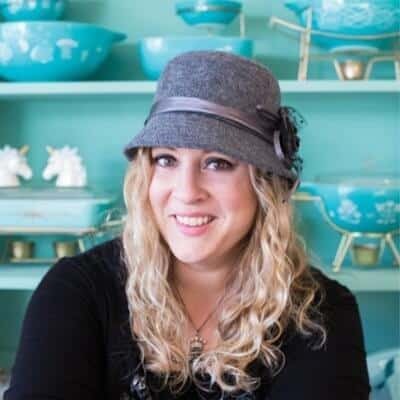 You can also do this in the Instant Pot! I did this on the stove rather than the crock pot and it was perfect! Two cartons of Campbell’s broth and an extra tbsp of powdered broth to make it stronger. Delicious! Will definitely continue to make this! How do you get extra strong broth? Can you buy it? Campbells soup makes a double strength beef broth in a 10oz can. What do I do with the whole tomatoes when it is done cooking? Will they cook down? Do I remove them? Chop them? Thanks for any feedback! I am making this tomorrow! Thank you for having a slow cooker recipe that isn’t finished cooking in 4 hours!!! What full time working parent gets home in 4 hours!? Can I substitute any other seasoning as I don’t care for the Italian mix? Made this soup last night, and all five of us loved it. Didn’t decide to make it until 4 pm, still yummy! One of my girls has IBS so I left out the garlic but kept in the onion, which she picked out. Worked for all us – great recipe! This is what I would like to have for dinner tonight! My family would eat this soup right up! What a delicious looking soup. I think my kids would devour this. I want to eat some of this right now! I think my kiddos would absolutely love this!! Soup recipe! I’ve made it five times this winter already! Hi! 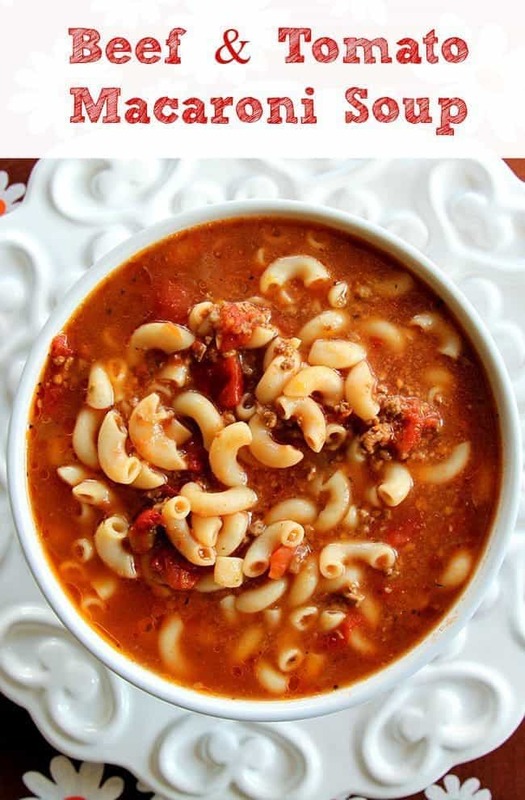 I made the beef & tomatoe macaroni soup and the whole family loved it! I used the pressure cooker because I decided to make it at the last minute. The ingredients are items most people have in the kitchen everyday and t was so so simple to make. This will definitely be a dinner or lunch that we will be having a few more times over the winter months. Thanks Karlynn! My, my, my. Such a lovely recipe! My 6 year old twins love it! As a working mum, this is great to make, as you end up with quite a large pot full of food. Dinners throughout the week are easily taken care of. I didn’t have raw garlic so substituted minced garlic from a jar, added tonnes of it, and it tastes delish. I also added extra dry pasta so as to have it thicker for my kidlets. I didn’t slow cook (as I hadn’t read the recipe right through). So I cranked up the gas to high, and in less than an hour, I had a healthy meal ready for the kids. I imagine it would taste just as great subbing lentils, rice, or risotto. Definitely a keeper of a recipe. Yum! Just wondering can this recipe be frozen? I would freeze it with the noodles JUST in the soup – don’t let them cook longer. Noodles can come out funny after being frozen. Will make this tomorrow! Looks like a yummy soul food cold weather recipe! Let you know how it turns out! 90 today in Tampa (again) but made this for the staff kitchen, even if not “soup weather.” Can’t wait to share it. Love simple, straightforward recipes like this. Simple is always the best. I can also eat soup no matter the temperature outside! Saw your video on Facebook and had to make this. Just like moms! Thanks for the recipe! My mom used to make this all the time, it was cheap and filling for a family of 6! I’ll be making this asap! This is a great recipe all on its lonesome but today, I experimented a little. I ran out of beef stock and had to use 1/2 chicken stock (boo) but added a little extra Worcestershire sauce to beef it up. Then I added a cup of carrots and lots of kale to give it a little more texture. I left out the ketchup since the carrots made it sweeter and finished the soup with some good olive oil after pouring them into the bowls. It was so hearty and delicious! 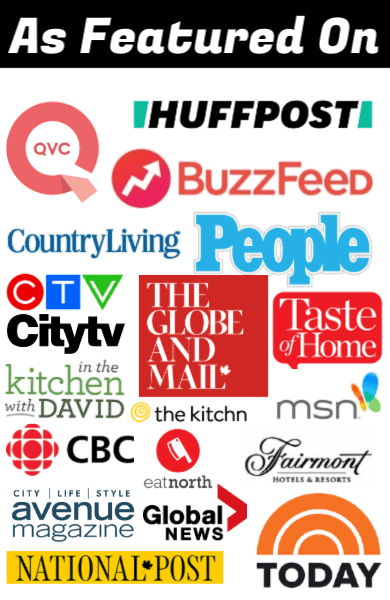 Thanks for a great baseline for many delicious interpretations of soup! Yes, you can customize it to your liking! Thanks for letting me know you liked it! I like the sound of the carrots in it! That’s what I normally use on it and it seems to work out just as well as the regular macaroni, if not a little bit more al dente. It’s kind of a nice in the soup for a little texture contrast. Admittedly, I make mine in my electric pressure cooker so that may make a difference as well. Ah-mazing! This is seriously the best beef and tomato macaroni soup everrrrrrrr! THANKS for the recipe! I can’t wait for winter! This was the best beef macaroni soup ever! Even the picky kids ate it! FANTASTIC! I can’t wait to make this allll fall and winter long! Maybe even all summer as well! The best recipe for tomato beef soup! Made this, but I used San Marsano tomato filets and whole peeled San Marsano tomatoes. Only needed one Tbs. of brown sugar. Added fresh basil and sliced mushrooms too. Used the beef broth concentrate to intensify the beef flavor. Served this to 6 people and they devoured it like I’ve never seen. Served it with a crusty italian bread. I am so glad it was a hit!! It’s my very favourite soup! Yummy, I added one can of pasta sauce instead of whole tomatoes, 1 can of water for pasta, celery, parsley, shredded carrots for more vegetables. I cut macaroni to 1 1/4 cups so all ingredients more even. Turned out so fabulous, I will make it again. Great winter soup.